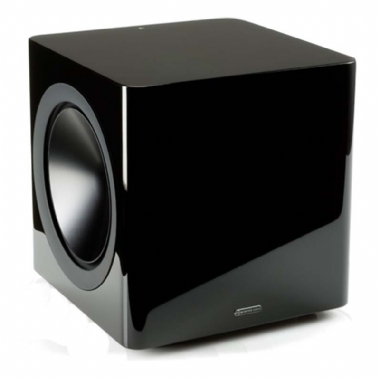 The all new Monitor Audio Radius 380 Subwoofer. Since the last Radius series we’ve applied our research and development to the challenge of subwoofer design. It’s relatively easy to produce large bass in a large box, but finding the optimum mix of parameters required to generate genuinely deep dynamic bass from a space efficient Radius cabinet requires a vastly more innovative approach. We’re confident that the ultra-compact Radius 380 will elevate your expectations of what’s possible in a small enclosure: the Radius 380 and its companion 390 rewrite the rules. Within the 380’s diminutive cube, twin side-firing 8” C-CAM® drivers - one active and one passive ABR - work in tandem with a powerful 200W cool-running Class D amplifier (double the power of its predecessor) to deliver a seismic bass foundation for films and music, distinguished by an intoxicating blend of depth and speed. Tuned for an utterly dynamic result with Radius satellites in film and music systems, the 380 also offers Impact, Movie and Music pre-sets for easy EQ operation. The drivers have no grilles but are colour-coded to coordinate with cabinet finish. A 12V trigger syncs the 380 with other AV components when the system is activated.